A Standard Method of assessment of plain radiographs for scoliosis is strongly recommended. The need for this is linked to the National Self-Detection Program for Scoliosis. Accurate measurement of the Cobb angle is central to management. 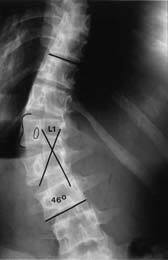 The minimum angle for the diagnosis of a structural curve is 10 degrees with accompanying vertebral rotation. A standing antero-posterior radiograph of the thoraco-lumbar spine to include the iliac crests is quite sufficient for the initial documentation of a curve. The abandonment of school screening for scoliosis in Australia, even though it was not uniformly practiced nation-wide, has led to the need for a new strategy to deal with this important health problem. In 1998 a self-detection program was introduced in Australia whereby all girls in Year 7 Government and non-Government schools received a brochure which described the outward signs of idiopathic adolescent scoliosis (AIS) in simple terms, with explanatory photographs. If, after reading the brochure, the girl or her parents think a curve is present, then it is strongly recommended that they consult the family doctor. A parallel education program for general practitioners was undertaken via the Australian Family Physician and a full paper on diagnosis and management was provided. The aim of the exercise is to have general practitioners become confident in the physical diagnosis of curvature and to assume responsibility of management of simple curves <20°. The program is endorsed by the Paediatrics & Child Health Division of the Royal Australasian College of Physicians. Adolescents are developing earlier and from 2018, each year via a direct approach to school Principals Australian schools with female pupils in Years 5 and 7 will be asked to download the Self-Detection Fact Sheet from this website and distribute it to students in those years. The purpose of this paper is to emphasize the need for radiologists to measure curves in a standardized fashion, and to include in their report certain observations which are relevant to management. A structural scoliosis is one in which the deformity is fixed and cannot be corrected by active or passive means. In simple terms, it is a contracture of the spine in three planes. In idiopathic scoliosis a spine with a previously normal alignment deforms in three planes – coronal, sagittal and most important, by rotation in the long axis of the vertebral column. The word idiopathic means literally, pathology unto itself, and indeed those with the condition are otherwise normal. Idiopathic curves are arbitrarily and conveniently classified by the age of onset – infantile (from birth to three years), juvenile (between four and the end of the ninth year) and adolescent (commencing at or about ten years of age, or later). Infantile and juvenile idiopathic curves are rare in Australia, and consideration of these entities is beyond the scope of this paper. AIS accounts for 80-90 percent of scoliotic patients in clinical practice. The aetiology of this disorder is far from understood. It is a syndrome diagnosis made by exclusion of those diseases (of which there are many) in which curvature may be a manifestation of the underlying abnormality. Although a genetic basis clearly exists in some families as an autosomal dominant trait, it is generally accepted that the aetiology is multi-factorial with a strong genetic background. 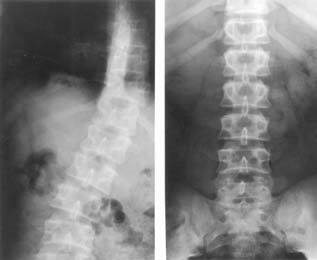 When a 10–13 year old girl is referred for a radiograph to verify the clinical diagnosis of a structural scoliosis, all that is required is an erect antero-posterior film of the thoraco-lumbar spine to include the iliac crests. In at least nine out ten of girls in this age range the full thoraco-lumbar spine can be captured on a 36 x 43 cm (14 x 17”) film: Vertically longer (91 cm – 36”) films are to be avoided to reduce gonadal and thyroid gland exposure. The need for additional views, estimation of bone age etc, is a clinically-based decision for the treating doctor. Radiographs for a patient with a spinal deformity should be taken with the patient standing, because there may be a difference of up to 10 degrees when gravity is eliminated (Figure 1). This effect is most often seen in thoraco-lumbar and lumbar curves, particularly in girls with marked generalized ligamentous laxity. Figure 1. Anteroposterior radiographs of a patient with AIS. There is a 14° difference between the angle of the curve with the patient supine (left) and erect (right). Note the wedging of T9 indicating long-standing deformation. The spinal surgeon clinically evaluates the curve from the posterior aspect of the patient and he views the radiographs in the same orientation; the reverse of how the radiologist views the film. A plea is made for the patient’s identifying data – name, age, date of birth and date of examination – to be displayed for the surgeon’s convenience. The Cobb method is the accepted standard technique world-wide. Figure 2. depicts how this should be done. Lines are drawn parallel to the upper and lower vertebral endplates of those uppermost and lowermost vertebrae which tilt towards the curve concavity. The angle is that which is made by intercepting the perpendiculars from these reference planes. Figure 2. Measurement of the Cobb angle. While it is acknowledged that the method measures in one plane a deformity which occurs in three planes, it is reliable and has stood the test of time. With practice the intra-observer error should be in the order 1-2°. Chinagraph pencil is recommended to measure curves as this is easily erased with xylene which does not damage the film. Measurement becomes more difficult with severe curves, especially if there is a kyphotic component in the deformity. Here it may be practical to use the upper or lower pedicle margins as the reference points. 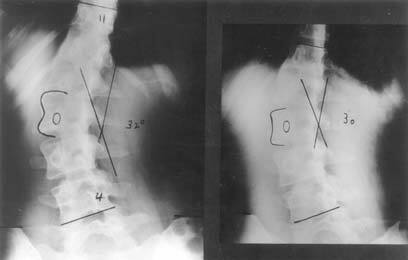 Sagittal plane deformity (kyphosis) is also measured by the Cobb method on erect films made with the upper limbs horizontal to the ground and resting on an intravenous drip stand. There is no agreed normal sagittal alignment in the adolescent but a reasonable upper limit is 40 degrees from T4 – T12. In thoracic AIS there is loss of the kyphosis and the deformity is lordo-scoliotic to a variable degree. All curves should be measured but the diagnosis of a structural scoliosis should not be reported unless there is a curve of 10° or more with concomitant rotation. These criteria are in keeping with the guidelines of the Scoliosis Research Society. This simple prerequisite would avoid unnecessary specialist referral and unwarranted parental concern. Nowadays, most parents read the radiologists report and frequently seek information from the Internet – this is often inaccurate, misleading and disturbing. 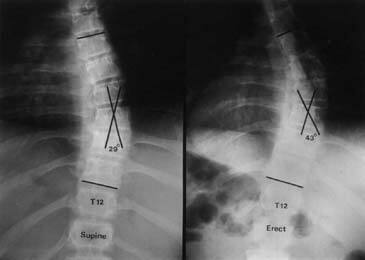 The key physical sign of a fixed structural scoliosis is a positive Forward Bend Test (FBT – Figure 3). If the spine rotates the ribs follow, and the prominence on the convex side is due to the costal elements. In the lumbar region, the erector spinae group on the convex side become more prominent (the bolster sign). Torso asymmetry based on skeletal dimorphism, is the commonest reason for a false positive FBT but here the difference in the heights of the profiles on the two sides of the trunk is <1 cm. This normal variant, present in 40 percent of Australian adolescent girls, is of no clinical significance, and these teenagers should never be subjected to X-ray examination. There is one variant of AIS which is most often seen in siblings of patients with AIS. It is viewed as the mildest expression of the deformity where the spine rotates in its long axis, but coronal plane deformity does not develop. The asymmetrical pedicle shadows and deviated spinous processes are diagnostic of this change which is of no clinical significance, even though the FBT is positive (Figures 4 and 5 ). Figure 4. Vertebral rotation without lateral angulation in an adolescent. Note the asymmetrical pedicle shadows in the mid-lumbar region. Also, the cortical definition of the margins of the spinous processes is unequal. Figure 5. Vertebral rotation without lateral angulation. The rotation of the lumbar spine in this adult male is marked but lateral angulation has not occurred. A right thoracic curve is by far the most common curve pattern, followed by a left lumbar one. Most idiopathic curves are based on six to eight vertebrae. A left-sided thoracic curve is frequently a manifestation of syringomyelia/Arnold-Chiari malformation; this curve pattern is an indication for an MRI scan. CURVE AND APEX DIRECTION. The apex is the most rotated vertebra in a curve and the one most deviated from the vertical axis. Frequently, two vertebrae are equally rotated. It is useful to outline the convex side and pedicle of the apical vertebra(e) (Figure 6). A curve, which is convex to the right, is a right-sided scoliosis and vice versa. Figure 6. A decompensated left lumbar scoliosis with the apex at L1. As a vertebral body rotates in an evolving curve, the pedicle outline on the convex side moves medially on the vertebral outline, while that of its concave counterpart becomes less evident, finally disappearing in severe curves1 (Figure 7). This is an important radiological observation as it tends to be an unfavourable discriminator for progression, especially in thoraco-lumbar and lumbar curves >40 degrees (Figure 6). In the antero-posterior radiograph, the line of the centre of gravity in the erect position should bisect the sacrum. Most of the scoliotic deformity resides in the intervertebral discs. However, with early-onset curves axial loading on the concave side of the curve can produce distinct wedging (Figure 1). The discs act as buffers to the pressure-sensitive vertebral growth plates, and the wide lumbar discs are more effective in this regard than the narrow thoracic discs. Hence, this is a sign of a long-standing deformation, even though the patient may be seen for the first time in adolescence. The iliac apophyses appear first at the anterior superior iliac spine and ossification travels medially to the posterior equivalent. On average, this excursion takes one year, with a range of seven months to three and half years.2,3 In clinical practice, completion of the excursion is taken as indicating the cessation of vertebral growth, the two events being no more than fortuitously contemporaneous. Some surgeons use this end-point for discontinuing orthotic programs, though it is widely agreed that AIS patients should be followed at least until apophyseal fusion. For documentation, the crest is divided into four equal parts and the excursion is graded 1 – 4; fusion is grade 5 (Figure 8). Not infrequently, the excursion is asymmetrical and it is prudent to scale on the less advanced side. There is no global agreement on the precise indications for orthotic treatment in AIS. However, most spinal surgeons consider bracing when curves exceed 30° and are in the range 30 – 45°, but with the proviso that there has to have been at least a 5° documented increase. When the question of progression arises it is often helpful to re-measure all previous films, and to compare these with the current film measured in an identical way. It is well established that at least one third of AIS curves in the cited range do not progress. Reliable data exist on the probability of progression in AIS based on the age of the patient and the curve magnitude at presentation (Table 1). The Risser Sign is also helpful in this regard (Table 2). (Nachemson, A; Lonstein, J; and Weinstein S: Report of the SRS Prevalence and Natural History Committee 1982. SRS Annual Meeting, Denver, Colorado, September 1982). (From Lonstein, J.E. ; and Carlson, J.M. : The Prediction of Curve Progression in Untreated Idiopathic Scoliosis During Growth. J. Bone and Jt. Sure., 66A:1061-1071,1984). The radiologist should note the relative heights of the iliac crests and comment on a difference of more than 1 cm. Not uncommonly, an adjustment to footwear can improve spinal balance, especially in decompensated-idiopathic thoraco-lumbar and lumbar curves (Figure 9). Figure 9. Decompensated left thoracolumbar scoliosis in an adult female (left). Spinal balance is improved when a 1cm block is placed under the left foot (right). Short-leg scoliosis is a commonly used misnomer, since the deformity is a lateral tilt without rotatory change (Figure 10). However, the deformity may become fixed with time. Figure 10. Standing anteroposterior radiograph of a 14 year old male with a 2cm true leg length difference. The lumbar spine is tilted to the left but there is no vertebral rotation. Neither is there any acute wedging of any of the lower discs, as is seen with disc prolapse in this age group (cf. Figure 11). While the principal focus of this paper is on AIS, it is relevant to comment briefly on several other less common types of curvature which may be referred for radiological examination. Most idiopathic curves contain 6 – 8 vertebrae, or even less. By contrast, neuromuscular curves are often longer and ‘C-shaped’ and tend, at least in the early stages, to have little of the way of vertebral rotation. Congenital vertebral abnormalities (CVA) are either those of failure of formation (hemi-vertebrae etc) or of segmentation (congenital fusion). Many variants of these may both be present in the same subject. Spinal deformity may develop, and be very severe, and unlike idiopathic scoliosis, can produce spinal cord compression. Because the vertebral end-plates may not be easily definable, accurate measurement can be difficult, particularly when curves are severe and when the configuration is kypho-scoliotic, as it frequently is. The use of upper or lower pedicle margins in the end vertebrae is the most reliable way to overcome these difficulties. Documentation of progression in congenital scoliosis is important. 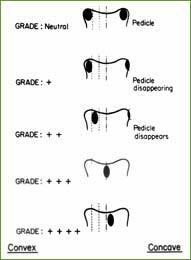 This may be an indication for early surgery because the curves are rigid and less correction is obtained surgically. Abnormalities which warrant the most careful longitudinal surveillance include fully-segmented hemi-vertebrae (particularly at the lumbo-sacral junction) and lateral unsegmented bony bars which have a malign tethering effect. There is 26% incidence of congenital genito-urinary abnormalities in the presence of CVA, and all patients with these anomalies should have at least a renal ultrasound study. Unilateral renal agenesis is present in 11% of these patients. Curvature is part of the phenotype of many syndromes and connective tissue disorders. Usually, the associated condition is evident on clinical grounds alone. Scoliosis is a feature of Type 1 Neurofibromatosis, in which short sharp curves are characteristic often with the diagnostic features of dysmorphic, scalloped vertebrae and pencilling of the ribs. Disc prolapse in the adolescent may produce an acute lateral lumbar tilt in the erect position. This disappears when the patient is supine (Figure 11). Further, there is no concomitant vertebral rotation. Strangely enough, disc prolapse in this age group may be quite painless, or relatively so, and patients are occasionally referred to scoliosis clinics. Figure 11. Adolescent disc prolapse. Standing (left) supine (right) radiographs. The lateral tilt due to reflex muscle contraction (spasm) disappears in the supine film. There is no vertebral rotation. Note the acute wedging of the lower two intervertebral discs. This 14 year old boy had no pain and was referred with a presumptive diagnosis of scoliosis. It has become clear that family doctors need assistance from radiological colleagues if their desirable role in diagnosis and management of minor idiopathic curves (< 20 degrees) is to be appropriately fulfilled. The radiologist should refer to the full paper as cited. A standard method of reporting on curves has much to commend it. 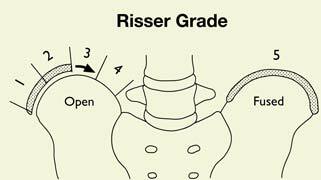 It is respectfully requested that the guidelines for curve measurement, documentation of the Risser sign, recording truncal imbalance and noting leg-length discrepancy as set down herein be followed. This is information that should be drawn to the clinician’s attention in the report as it bears strongly on patient care.